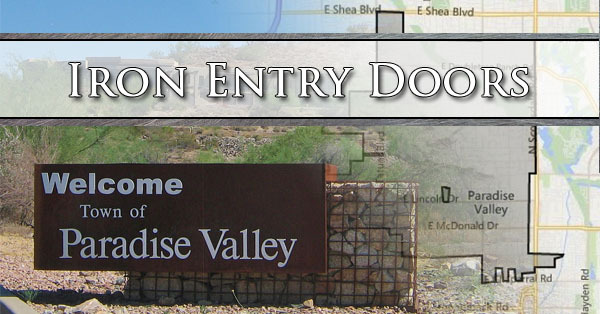 Having iron entry doors installed on your Paradise Valley, AZ home creates a custom and beautiful feature in your architecture. 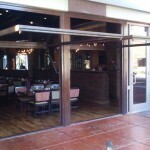 The doors that we create are custom made, to the tailored needs of your location. We have selected work from previous jobs featured on this page to help inspire you and get the creative juices flowing. Once you have an idea of the style you can tell us what you want, or you can work with a in-house designer to help prep a design for our fabricator. There are many different styles and each of them carry a character that will compliment your home in different ways. 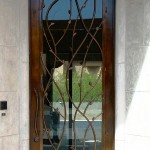 Iron Entry Door Options: Style and custom design is the hallmark of Artistic Alloys custom iron doors. 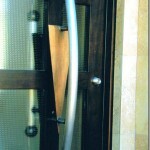 You can choose your own styles of handles, decorative glass, and even custom paint finishes, and much more. 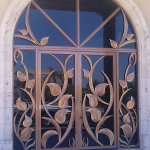 Artistic Alloys LLC is Scottsdale Arizona’s top producing manufacturer of wrought iron entry doors, custom steel and metal doors for commercial and residential properties in the Phoenix East Valley area. Having iron exterior doors installed in your front entry way is one of the best ways to upgrade the exterior of your home. It is the focal point of all the visitors coming to your home. Artistic Alloys can fully customize the design of your iron exterior door, fabricate it in our shop, and install it securely in your home. 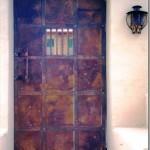 Iron entry doors do much more than just add security to your business or home in Paradise Valley. 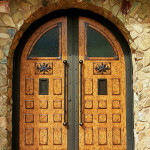 These doors compliment the aesthetic look of your properties and add valuable curb appeal. The entry ways we use for our homes and businesses are the focal points of most architectural styles. Attention is drawn naturally from the lines of the home to help indicate the point of entry. The doors sitting in these spaces should live up to the calling and be as strong as they are beautiful. Increased Property Value – Improvements you make on your home increase the value of the properties. 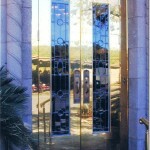 Iron entry doors are a secure and dependable way to increase the value of any residential or commercial property. 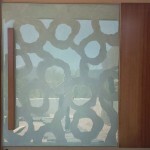 They improve the look, and security of any property they are installed on. Best of all if you do decide to sell your home, they help you get higher resale values. 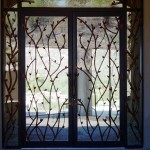 Unique Visual Appeal – When you either have your own design, or work with one of our expert iron door designers, you will have a custom, one of a kind piece installed on the exterior of your home. Expert design paired with uncompromising fabrication and welding results in the best looking, longest lasting, and most functional iron doors in the industry. Dependable Durability – Iron has been used for centuries because of its durability. 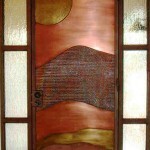 When it is used to build entry doors with the experience of a master creative metal worker it will last for a lifetime. 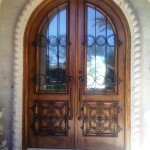 With timeless and beautiful design and fabrication you will enjoy your iron entry doors for many years to come. Our dedication to quality fabrication and understanding of how to finish iron so it weathers the Arizona climate is what separates us from the competition. 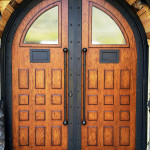 There are many styles to choose from, and some blending that clients like to create one of a kind iron entry doors. These 4 styles of iron doors are some of the most popular and can help get a feel for the type of entry door our clients would like to design. Modern Mystique – These doors tend to have more straight lines, squares, circles, and other geometric shapes that make them have a very edgy and modern look. These shapes are sometimes put on top of each other to make a deep and diverse design . Old World Authentic – Many homes have very old world architecture. Places that have columns and a lot of stone work call back to older ages where construction materials were very different than today. 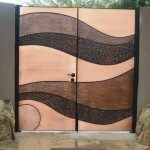 The iron entry doors that are installed in these cases are made to have the same old world charm and appearance. They complete the look of these beautifully crafted homes that evoke a sense of history. Classical Style – Detailed and embellished horizontal and vertical bars are very common with classical style doors. Windows are also very popular on the classical styles. The embellishments such as bolts or large nail heads give a visual appearance of classical and traditional tools that were used before modern metalworking technology came along. Rustic Retreats – Some homes are meant to be hold outs for the lovers of the outdoors. 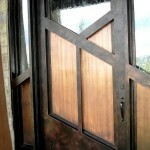 Elements that call back to mountain homes and cabins can be added to the design of your iron entry door. These elements help create the visual cues that quietly speak to the calm and relaxing environment that is behind these doors.